Farm-to-table bistro Royal Stone and leading San Diego craft brewery Stone Brewing will join forces for an Oktoberfest celebration in Bankers Hill. The Two Stone’s Oktoberfest will be a six course beer paired dinner on Sunday, October 16, offering a German-inspired feast complimented by special craft brews. 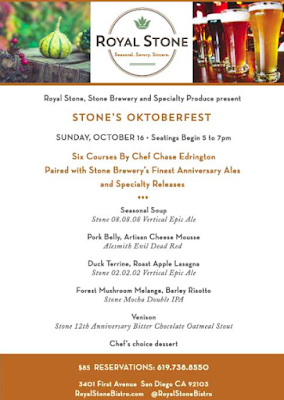 Reservations for Stone’s Oktoberfest at Royal Stone will begin between 5 and 7pm and will feature German-inspired fare such as Forest Mushroom Melange, as well as Venison and Roast Apple Lasagna with Duck Terrine from Royal Stone’s Executive Chef Chase Edrington, alongside five Stone Brewing anniversary ales and special releases. Opened in Spring 2016 on a cozy corner in Bankers Hill, Royal Stone is a family-owned restaurant emphasizing dining as a special time for gathering with friends and family - a holdover from owners John and Jackie Stone’s European heritage. European-trained Executive Chef Edrington learned to farm before learning how to cook, launching his career by first spending eight months farming and cooking at a bed-and-breakfast in Portugal. The next couple years saw Chase working on organic farms and training in Michelin star kitchens in Spain, Italy and France before entering San Diego’s dining scene. He joined Royal Stone as Executive Chef upon its opening in March 2016. Reservations to Stone’s Oktoberfest are priced at $85 plus tax and tip per guest and can be secured by calling 619.738.8550. Royal Stone is located at 3401 First Avenue in Bankers Hill. For more information, visit RoyalStoneBistro.com.